Alex Wortley reviews Michelle Cahill's new book, The Herring Lass. 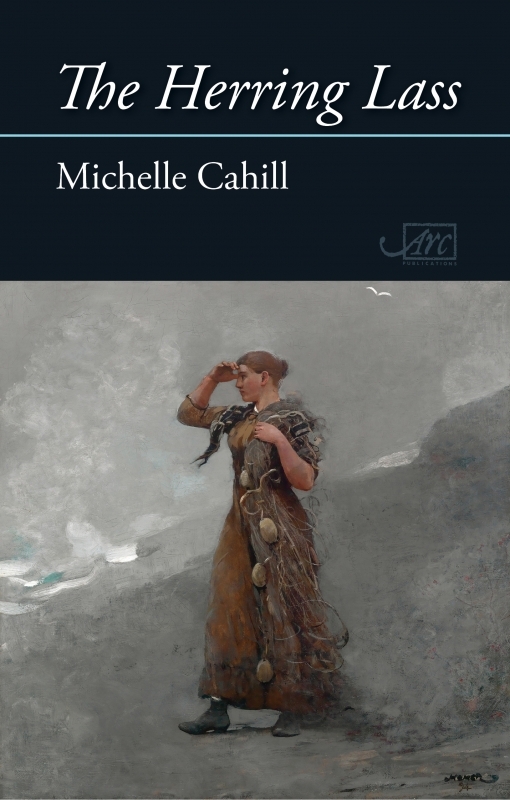 Michelle Cahill’s latest collection is a wide-ranging volume that moves through history, time, and geographical space: her poems roam from present day Afghanistan to Fourteenth-century England. Along her journey, Cahill ventriloquises man, woman, and beast alike, from the title poem’s working-class ‘herring lass’ to a woman housekeeper, to a stranded polar bear. What unites the diversity of voices in Cahill’s poems is a shared sense of isolation. These figures are often marginal, and through them Cahill examines the experiences of colonialism for the colonised people. Many of the poems display a lyrically muscular style, and Cahill’s tone, cold but not callous, seems be born of the trauma, isolation, and loss that she describes. Her best poems contain rich allusion and description which belie a simmering emotional intensity. The collection’s initial poem ‘The Herring Lass’ serves as an introduction to Cahill’s poetic mode. The poem allegorises colonial displacement and exile. The herring lass ‘tramps from port to port’. The subject is feminised as the position of women is analogous with the position of colonised people: she is similarly subjugated and marginalised within society. Her life is hard, and while ‘the day unfinishing’, she stands in the ‘dark, guttering cold’, the men around her ‘have all prospered’. She is marginal among men, those blacksmiths and fishermen who ‘bustle in the courtyard […] no word exchanged’. She is seemingly chained to the unchanging cycle, as the herring ships ‘drift with shoals of migrant herring’, but we see a glimpse of potential violent resistance when ‘[h]er knife flashes’ as she works. Cahill assumes the voices of animals, such as a polar bear in ‘Bear’ or a hunted seal in ‘Day of a Seal, 1820’. In ‘Twofold Bay, 1930’, Cahill describes the hunt of a whale in visceral detail, stressing the human violence. A ‘stalked’ calf is harpooned and the speaker ‘feel[s] his gums sting’. Whale hunting finally becomes an allegory for imperialist expansion: ‘I see his country, fin keel and genitalia, the sharks / descend’. This is the same technique signalled by ‘The Herring Lass’, the act of allegorising colonialism through the lives of outsiders or animals in distress. Cahill herself is Kenyan-born, ethnically Goan-Anglo-Indian, and lives in Australia. Her poems here seem to reflect her rich cultural background. ‘Harbour’ and ‘The Edge of Empire’ delve more into the complexities of identity of colonised peoples. From the fishing town of ‘Harbour’, with its ‘curved gables’, the speaker dredges up a ‘drowned’ colonial memory of ‘Zambia’s swamps’. The traveller retrieves the expunged subaltern history. Similarly, ‘The Edge of Empire’ speaks for anticolonial resistance to divisive imperial endeavour, a process that is both linguistic and geographical. The Roman desire to demarcate and map the Orkney Islands is likened to the Stalinist division of Berlin (and Germany as a whole) and the Zionist apartheid in Israel. This is a familiar process of divide and conquer, then, but it fails: ‘there was no caesura, no straight lines / at the edge of Empire’. Cahill’s ‘caesura’ puns on the name of Rome’s primary expansionist ruler, Caesar, and alludes to the ‘straight lines’ of Roman roads. Cartography and standardisation are colonial tools for exerting authority over colonial subjects, as is language: Cahill’s ‘caesura’ – a way of signalling a strong pause in a line of verse – gestures to the forcible imposition of language as an imperialist strategy. In the latter half of the collection, Cahill’s cold lyricism often thaws into a more colloquial voice on a more quotidian theme. Take the aptly titled ‘Real Life’, for example. The speaker wakes, and habitually spools through apps on their IPhone: ‘windows live mail, FB, site stats, country / by country’. The usual third person pronouns are replaced with the personal ‘I’, which signals a more confessional mode, a stance exemplified in such lines as, ‘I expose my fragility to the blue / lit-LED monitor with full H-res’. But despite the tonal disparity between this poem and the opening poems of the collection (such as the title poem) the theme of loss or isolation persists. As the speaker remarks in ‘Real Life’: ‘Cup my face in my hands. Felt the river of grief / wash through’. But what has bereaved the speaker we are left to ponder. The Herring Lass is a fine collection of poems. It is assured and adventurous, with a pluralistic quality; Cahill is at home describing animal or people in sometimes wholly different registers. This confidence in a number of different voices and subjects speaks of a poet with great natural gifts. Overall, this is a collection of striking thematic unity, and Cahill boldly executes her vision.